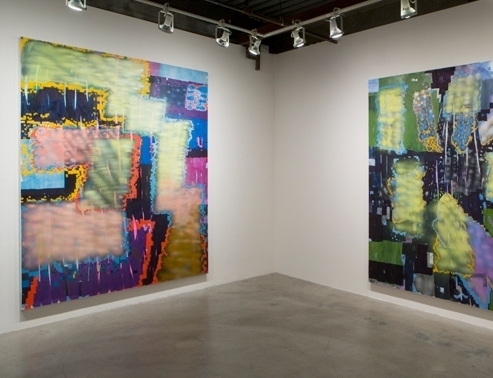 Keltie Ferris is a New York-based artist who, armed with a spray paint of vaporized oil pigments, has developed a fresh and entirely original abstract language. Doomsday Boogie includes several of Ferris’s large-scale paintings, along with a series of thin vertical paintings—physical realizations of the zips that originated in Barnett Newman’s abstract expressionist work. The larger paintings, with their pixelated backgrounds and neon, atmospheric foregrounds, evoke technological cityscapes. They have all the layered space and temporality of Tron, City of Night, and masterpieces of sci fi-noir. The paintings measure up to nine feet and juxtapose earthy blacks, greens, purples, and browns with vivid, chemical shots of gold, red, pink, acid green, and chartreuse. To achieve her desired effects, Ferris overlays hand painted geometric grounds with her signature, graffiti-like markings in spray paint. 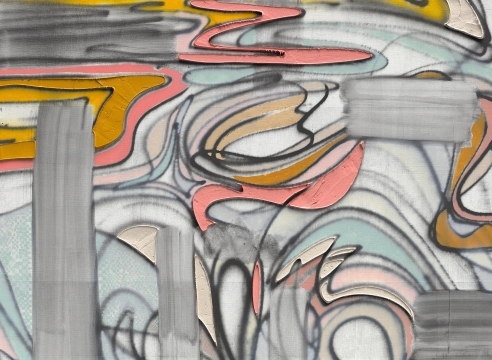 In select pieces she also outlines the fields of spray in abrupt, vertical strokes of color. Keltie Ferris: Doomsday Boogie is organized by Jeffrey Uslip, curator-at-large for the Santa Monica Museum of Art. Keltie Ferris was born in Kentucky in 1977 and lives and works in Brooklyn. She received her MFA in 2006 from Yale University in New Haven, CT and her BFA in 2004 from Nova Scotia College of Art and Design (NSCAD). Her solo show Maneaters was on view at the Kemper Museum, Kansas City, MO in 2009. In addition, her paintings have been included in group exhibitions at institutions around the country, including The Kitchen, New York; The Addison Gallery, Andover, MA; the Nerman Museum, Overland Park, KS; and the Indianapolis Museum of Art in Indiana; in addition to galleries in the U.S. and abroad. She is the recipient of both a Jacob Javits Fellowship and a Rema Hort Mann Foundation Grant. This exhibition has been made possible by SMMoA’s Ambassador Circle. Support has also been provided by the City of Santa Monica and the Santa Monica Arts Commission and the Los Angeles County Board of Supervisors through the Los Angeles County Arts Commission.